A home theater can take many forms. Some designs may have a couple rows of reclining chairs, a massive projection screen, and special lighting along the floor and walls to really capture a true cinema feeling. Others may be a more understated affair, with small but powerful speakers hidden around the room so the casual onlooker will never notice them. 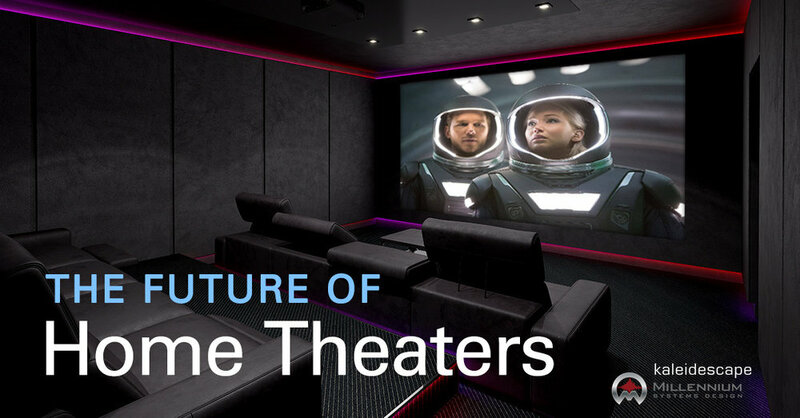 Home theater trends are always changing, though, and the elements that we expect to see in modern layouts may not be the most important thing to have in a couple years. Right now, we’re seeing giant 4K TVs dominate the home theater space, and things like wireless sound systems have become more prevalent, and there is a definite shift from complex systems and huge speaker racks for simpler, smaller options that still pack the same experience. So, given the amount of change we’ve seen in modern home theaters, what trends should we expect to see a little further down the road? Forget searching around for a misplaced remote. You will soon just tell your home system that you’re in the mood for a movie. In fact, you won’t even have to specify a movie. You’ll just describe your mood and the AI in your theater system will try to select the perfect movie to suit it. You won’t have to stop there, either. That same system will be able to use presets to create the right theater atmosphere. It could automatically turn down the lights and switch your sound preferences with a single word. Voice control may not be a new idea, but as technology advances, it’s going to be something more people use naturally. These systems will also be able to learn and adapt to our preferences. We’re already seeing this kind of intelligent adaptation with products like the Google Home Max, which was just introduced this October. This small but powerful speaker is able to “sculpt” the sounds it produces to fit the space it’s in. Google is calling it “Smart Sound,” and, in theory, it will try to analyze the acoustic properties your home theater and adjust its sound curve – in real time – to produce the optimal sound experience. Which just goes to show that the future of home theaters is always getting more impressive. These TVs use Quantum Dot technology, which really enhances color options on 4K TVs. It works like other LCD TVs, with LEDs providing the necessary light, but instead of the standard white light, the LEDs project a blue light. There’s a lot of technical speak behind why this is an important difference, but it boils down to how the size of each tiny quantum dot is associated with a single color. When you pass the high-energy blue light through them, you get very pure reds and greens and blues that aren’t possible with other LCD TVs. Quantum dot technology seems to be a little less expensive than OLED, so in the near future we’ll probably see more TVs go this route. However, since OLED is all about contrast and high dynamic range, we should expect to see more of it in the future, too. As the prices on some great home theater equipment continue to drop, more people will be able to install some kind of system in their home. Of course, the availability of better technology doesn’t automatically increase the availability of space. Many people simply don’t have the space to dedicate to a home theater. But they can justify a “media room” where they can watch movies, binge watch their favorite series, or set up an incredible gaming system where they can play with others (online or in person), or maybe take in a couple rounds of golf. Will All Media be Streamed? Our favorite streaming services are extremely convenient and they provide a solid movie-viewing experience. Many of them are even offering 4K streams to some extent. However, as much as Netflix would like to guarantee that you can watch every minute of your favorite movie in stunning Ultra HD resolution, they just can’t. Not yet, anyway. There’s something between your movie night and an uninterrupted 4K experience, and that’s called an internet service provider. If you have a great and reliable connection that provides blazing fast speeds… you’ll still probably have to put up with occasional resolution drops or buffering pauses. While this will likely change in the future, the most reliable theater experience is going to come from media that doesn’t rely on a third party to deliver it at the time of viewing. So, for now, physical media and full 4K digital downloads are your best options for uninterrupted, UHD viewing. And if you go the download/home media server route, you’ll get all the convenience of a streaming service without the potential interruptions of data streaming. There are a lot of great new developments on the horizon for the home theater. The future is pretty bright (with a very high contrast ratio, too).